So where does that leave you as far as cooking is concerned? Well, you have a few options depending on your particular situation. Just to get things started off on the right foot, let’s define a couple of terms. The term “camping stove” can mean a few different things, so it’s probably helpful to lay out exactly what we’re talking about. First of all, the term “stove” technically refers to enclosed spaces that are used for cooking food or providing heat, i.e. wood burning stoves and ovens. Residential kitchen stoves typically combine an oven with a range top, and similar devices are commonly found (albeit sized-down appropriately) in recreational vehicles. However, the term “camping stove” doesn’t refer to ovens. When the term “camping stove” or “camp stove” is used in the RV industry (or even in more generalised camping contexts), it refers to a portable or permanently-installed cooking device. Rather than being enclosed, like a residential oven, camping stoves provide a cooktop that can be used in conjunction with a variety of pans and skillets. Some camping stoves run on propane, others use butane, and there are also some wood burning camp stoves. Some larger pop up campers include a camp stove/oven combo as standard or optional equipment, although camping stoves that don’t include an oven are very common. One popular kitchenette layout involves a counter with a sink next to a camp stove on top and a fridge or icebox underneath along with cupboard storage. Either due to space limitations, or as a cost-cutting measure, some pop up campers don’t come with any sort of stove or oven. 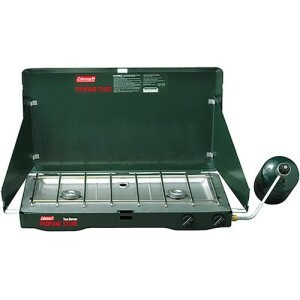 In some cases, such as the Jay Series Sport 8, the optional equipment includes a “carry out camp stove.” This type of camping stove is portable, so you can either set it on the counter next to the sink or literally carry it outside and use it on a picnic table. In some cases, a pop up camper will actually have propane “plumbed” to the kitchenette area, which allows you to plug in a portable camping stove when you’re using it inside. In addition to standard and optional equipment from the OEMs, portable camping stoves are also available from a variety of camping gear manufacturers. These portable stoves express a remarkable level of variety in burner style and number of burners, fuel type, and other features, so it’s typically a relatively simple task to find one that’s perfectly suited to your specific needs. For instance, if you camp by yourself or with one other person, a lightweight single burner camp stove will get the job done and make for easy packing. However, large families or people who camp in big groups are better off with heavy-duty multi-burner stoves. Coleman’s Perfectflow single burner stove is about as simple as they come. Coleman’s Perfectflow is an example of a single burner camp stove that’s just about as simple as it gets. This camping stove essentially consists of a base, a single burner, a pot shield, and a regulator. The structural body of the stove is actually formed by the propane bottle itself–in order to assemble the unit, you set a 16.4 ounce propane bottle in the base and then attach the burner/regulator/shield assembly to the top of the propane bottle. Although single burner camping stoves are of limited utility to anyone who needs to cook more than one thing at a time, the 10,000 BTU burner itself is big enough to fit relatively large pots, pans, and skillets. On the lowest setting, this camp stove will burn through its 16.4 reservoir of propane (bottle not included) in about nine hours. On the highest setting, it’ll burn out in a little over two hours. Of course, it can also boil a quart of water in four minutes flat, so you can get a remarkable amount of cooking done. 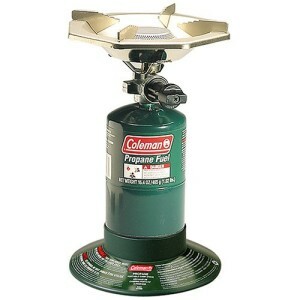 Coleman’s two burner unit is an archetypal camping stove. This two burner stove is the next step up, size-wise, from Coleman’s perfectflow, and it’s also fairly representative of the most common form factor. Like most portable two burner camping stoves, it folds flat for storage when it isn’t in use. When it is in use, the lid forms a protective backstop, and it also has fold-down sides to provide additional protection from the wind, which you don’t get from a single burner stove like the Perfectflow. While the Perfectflow has a single 10,000 BTU burner, this stove has two 10,000 BTU burners, each of which can be controlled seperately. It’s also designed to use the same 16.4 ounce propane cartridges that the Perfectflow and many other Coleman appliances use. 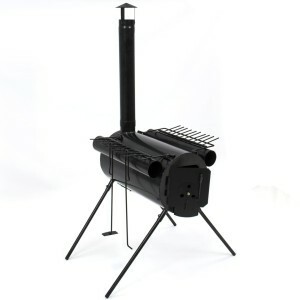 In order to use these camping stoves with traditional propane tanks, additional hardware is required. Most portable camp stoves use propane, and nearly all built-in camp stoves, ovens, and ranges use propane, since most RVs come with onboard propane tanks. Also referred to as LP and LPG (liquefied petroleum gas), propane is relatively easy to obtain and transport. It’s available at a lot of gas stations, truck stops, and other locations on the road, and you can also fuel up relatively small, lightweight canisters to bring along on a camping trip. Of course, that doesn’t mean all camping stoves burn propane. Wood burning camping stoves can often be used as heaters in addition to cooking your meals.